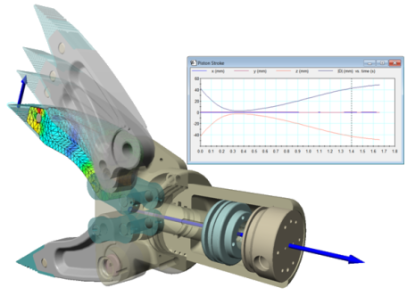 SimWise FEA for ZW3D is a Finite Element Analysis tool that performs linear stress analysis on mechanical parts designed in ZW3D. It is highly automated and handles much of the complexity associated with FEA while offering powerful features for users who are steeped in the intricacies of the Finite Element Method. It transfers geometry directly from ZW3D and allows you to add structural specific entities to the model resulting in a functional structural prototype of your design. It simulates that prototype using advanced physics and mathematical techniques and presents the results of the simulation in various graphic and numeric formats. 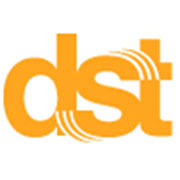 You can quickly determine whether your design is robust enough to operate as intended or if modifications are necessary. All on the computer, all without costly and time-consuming physical prototypes and before warranty issues arise. All of these values can be driven by the SimWise formula language. All of these objects are applied to the underlying geometry, not to nodes and elements as in a traditional FEA product. SimWise uses a fast iterative Finite Element Analysis solver that takes advantage of multi-core processors and which is based on a Preconditioned Conjugate Gradient method. 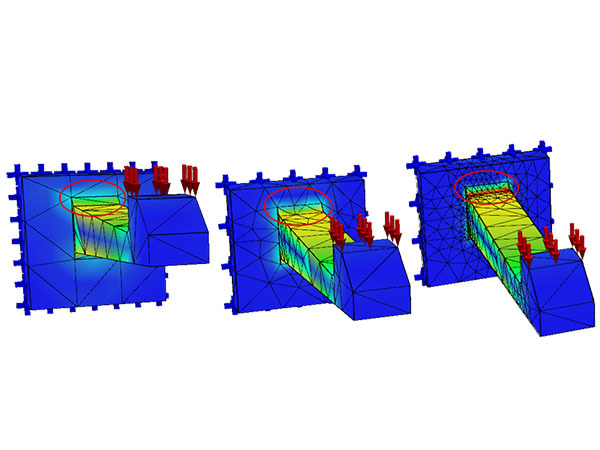 SimWise FEA exclusively uses ten-node tetrahedral elements and the solver is optimized for this type of problem. SimWise FEA can display FEA results as shaded contours, deformed shapes, or animations. In addition to these engineering values, SimWise FEA also calculates factors of safety and errors in the stress results and both of these can be displayed as shaded contours. 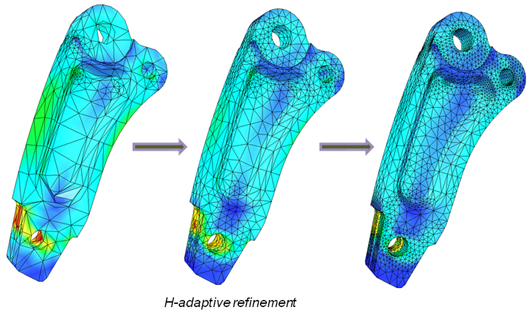 The error results can be used to drive an iterative solution process called h-adaptivity where the error results are used to refine the Finite Element mesh in areas with large error values and use that new mesh to run another solution. The errors in the new solution are compared to a goal and if error values in the model still exceed the goal, the process is repeated with successive mesh refinements and analyses until the error goal is achieved. Confidence in the results are increased and no special knowledge about appropriate meshing techniques is required.